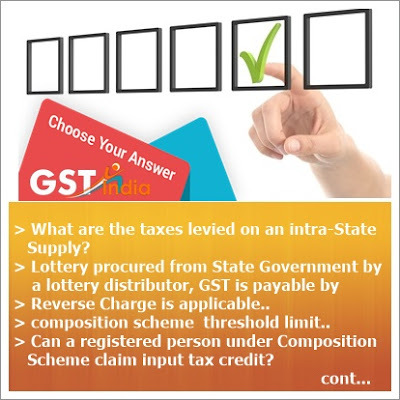 What are the taxes levied on an INTER-State Supply? What are the supplies on which reverse charge mechanism would apply? When can credit for tax paid under Reverse Charge Mechanism be taken? What is the threshold limit of turnover in the preceding financial year for opting to pay tax under composition scheme? What is the rate applicable under CGST to a registered person being a manufacturer opting to pay taxes under composition scheme? Can Composition scheme be availed if the registered person effects interstate supplies? Can a registered person under Composition Scheme claim input tax credit? Can a registered person opting for composition scheme collect tax on his outward supplies? Which of the following will be excluded from the computation of ‘aggregate turnover’?